John Fitzhugh Wyckerly is the younger son of a drunken, irresponsible earl who has mostly ignored his spare. Fitz, a mathematical genius with an interest in insects, has used math skills to support himself through gambling and stayed out of the orbit of his father and older brother since he left home at seventeen. But when his brother breaks his neck in a drunken fall shortly after inheriting the title, Fitz finds himself the seventh Earl of Danecroft, heir to a crumbling estate, overwhelming debt, and creditors eager to see someone suffer for their losses. Fitz’s sole resource is a stallion he won in a bet. On his way to collect that resource, he also collects his six-year-old illegitimate daughter, Penelope, whose unruly behavior gets them tossed off the stagecoach. Fitz is in desperate need of an heiress to wed.
Abigail Meriweather, daughter of a magistrate, owns the small farm that had been part of her mother’s dowry. After the deaths of her stepmother and father, she had been content to run the small holding and care for her four half-siblings: Tommy, 10; Jennie, 6; and twins Cissy and Jeremy, 3. But her father’s solicitor decided the children needed male guidance and had them sent away to a childless couple who would act as their guardians. Abby has vainly petitioned a distant relative, a marquess, for help, but in the face of his silence, she has decided that her only hope of reclaiming custody of her young siblings is to find a wealthy, influential husband. When Fitz and his daughter are dumped almost on Abby’s doorstep, she offers them shelter despite her misgivings. Young Penny quickly wins her heart, and Abby and Fitz, both determined to ignore the attraction between them, are beginning to become friends. That budding friendship is tested when the widow of the silent marquess shows up and Abby learns that Fitz is an earl. The marchioness plans to dower Abby and take her to London to find a husband, thus enabling her to insist on the return of her siblings. Fitz and Penny follow them to London where Fitz finds fault with all the candidates for Abby’s hand. Practicality and the marchioness say Abby and Fitz are all wrong for each other, but their hearts carry a different message. 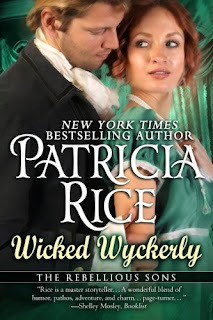 This first book in Rice’s Rebellious Sons series was named one of Booklist’s Top Ten romances of 2010 and included in an impressive field of Rita finalists for Best Regency Historical in 2011. It is one of my all-time favorite Regency-set historicals. Abby is a delight with a strong will and a tender heart, but it is Fitz who makes the book for me. He has none of the arrogance so often found in romance heroes. In fact, he has quite an humble view of himself. He also has some memorable lines about heroic expectations. The children are mischievous, vulnerable, and endearing. The financial problems Fitz faces are real, and Rice does not trivialize them. The relationship between Fitz and Penny and between Abby and her siblings and the relationship Abby develops with Penny and Fitz with the young Meriweathers are important and believable. Another of the best things about the book is that there is no fairy tale solution to the burden that Fitz inherited. There is hope, but the resolution falls within the bounds of reason. Best of all, the reader is left with the happy conviction that Abby, Fitz, Tommy, Jennie, Penny, Cissy, and Jeremy will live and love together in familial harmony that will doubtless gain from new additions over the next few years. I sound one note of caution. If you are a reader who dislikes children in romance novels, you will want to give Wicked Wyckerly a pass. But if you like romance that is humorous and substantive, romantic and real, I highly recommend this book. I just read it for the fourth time, and this time I am following the reread with rereads of the other three books in the series: The Devilish Montague, Notorious Atherton, Formidable Lord Quentin. All are good, but The Wicked Wyckerly is the best. I have it on my Kindle to read. Ms Rice writes wonderfully humorous stories. I don't mind books with children in them, This sounds good. I will have to dig through my TBR mountain to see if I have this one as well as the others in this series. I have read several o fPatricia Rice's books and enjoyed them. I like the extra dimension that children add to stories and the situation these find themselves in adds a layer to the story. It is nice to get to the HEA, but one that is realistic is not always the case. Life doesn't wrap everything in a neat bow with all troubles overcome. A good story will do the same. Thank you for the review and recommendation.